You are here:Home Vocal Technique How can I help a singer eliminate their breaks? How can I help a singer eliminate their breaks? One of the greatest challenges that a student of singing faces is moving from the lower register (chest voice) into the upper register (head voice) smoothly. The muscles that tend to dominate each register of the voice seem to be antagonistic, or at odds with one another. 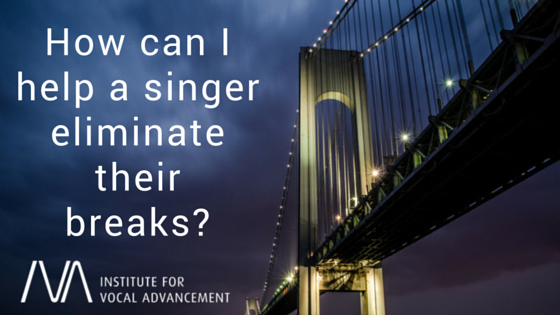 This antagonism causes many singers great frustration. The break in the voice can feel like an insurmountable obstacle. As singing teachers, one of our most important goals is to smooth out this transition, or passage, between the lower and upper registers in a student’s voice. We want the student to be able to sound as if there is a blend, or “mix,” of registers—to sound as though they are singing in one unified voice from the bottom to the top of their range. The vocal sound we are after is both powerful and free. A good voice teacher is able to give a student specialized exercises for the student’s specific vocal tendencies that will help them develop this mixed voice and, thus, smooth out their breaks. Regardless of what is often written in marketing materials for singing programs, learning how to sing across the passages smoothly (especially at volumes necessary for professional singing) takes time, patience, and a lot of practice. There are points in a singer’s vocal range when the vocal folds change from a short and thick condition (most common when singing lower pitches) to a long and thin vocal fold condition (which is most common in singing higher pitches). This change in vocal fold configuration occurs at the same time that the singer is experiencing shifts of resonance sensations from one part of their body to another. The combination of mechanism changes and perceived resonance shifts causes most singers to experience breaks in their voice. The most prominent break point for most people is the transition that occurs toward the top of their chest voice. The first step in beginning to smooth out this transition is understanding that at this first passage, the singer must experience a sensation that is neither pure falsetto, nor pure chest voice. We call this the middle voice, or the mix. Our goal is for the student to transition gradually from chest voice to head voice while keeping their larynx in a relaxed, neutral or resting posture (neither jammed up as in swallowing, nor locked down as in a full yawn). The vocal folds must maintain a balance between cord adduction (closure) and airflow. What actually happens physiologically is different from what singers often experience; therefore, the so-called “scientific approach” to teaching singing can be filled with its own pitfalls. It’s important that we teach singers from their perspective rather than confuse them with too much terminology, which may cause them to attempt to directly control parts of the mechanism that are involuntary. Pulled chest: The singer can continue to stay in the unmodified chest voice as the pitch rises. This will require that the volume increase as the pitch rises. The feeling is akin to yelling. Carrying this unmodified chest voice too high results in too large of a vibrating mass, the larynx usually rises, the vowel distorts, and the tone tends to be under-pitch or even flat. To the listener, the sound is strained, and it feels strained to the singer as well. This condition causes much vocal damage in singers. Falsetto: The singer can let go of most of the adduction of the vocal folds in order to sing on a smaller vibrating mass by singing only the outer edges of the cords. This is called falsetto. It sounds very airy with no carrying power and is usually accompanied by an obvious break. Falsetto cannot easily blend with the rest of the voice. Although pure falsetto is not potentially damaging, it is not the “full-voiced” sound that the majority of singers and listeners desire. Mix: The singer can stay connected to the chest voice while at the same time allowing a gradual thinning and stretching to occur. This type of mixing action can be developed into a very full and resonant sound (unlike falsetto), but is less likely to feel strained or invite vocal damage, as in the pulled chest sound. Obviously, the most desirable option in crossing the passage from chest voice to head voice is to develop the mix. The ability to sing in a mix allows a singer to maintain a relatively relaxed laryngeal posture, while keeping a comfortable balance of cord closure and airflow. Developing the mix is valuable for singers of virtually every style of music. Over time, the mix can be built into a very solid, rich, and full sound. The mix is versatile. It can be used to sound like an extension of the chest voice (i.e., a belt), or like a downward extension of the head voice. The mix enables the singer to move through their voice with no apparent breaks of any kind. There is no shortcut to finding or developing the mix. It isn’t magic. It’s not a parlor trick. Developing the mix is the result of working hard with a well-trained vocal instructor over time, on a regular basis, and properly training the voice each and every day. Each singer has their own vocal needs that must be addressed, so there is no single vocal program that can be successfully followed by all singers. This is why it is rare for singing students to truly master the ability to mix by using pre-packaged, self-study singing programs. Each voice is unique and each vocal tendency must be treated in its own way. How do you help a singer eliminate their breaks? By continuing to train and educate yourself as a teacher so that you are able to give your students the precise tools they need at each stage in their development.